This recipe is from the book The Italian Slow Cooker by Michele Scicolone, which I have previously reviewed. With permission of the author, I will now share one of the wonderful recipes from the book and at the very end, I will share what I did differently out of necessity*. In a large skillet, heat the oil over medium heat. Sprinkle the meat with salt and pepper and brown it on all sides. Remove the meat to a large slow cooker. 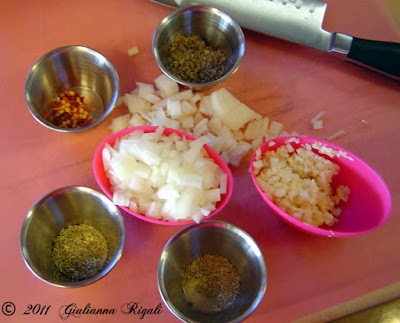 Add the onion and fennel seeds to the skillet and cook until the onion is tender and golden, about 10 minutes. Stir in the garlic, sage, and rosemary. Add the tomato puree, tomatoes, and a pinch of salt and stir well. Pour the sauce into the slow cooker. Add the crushed red pepper. Cover and cook on low for 5 to 6 hours, or until the pork is very tender. 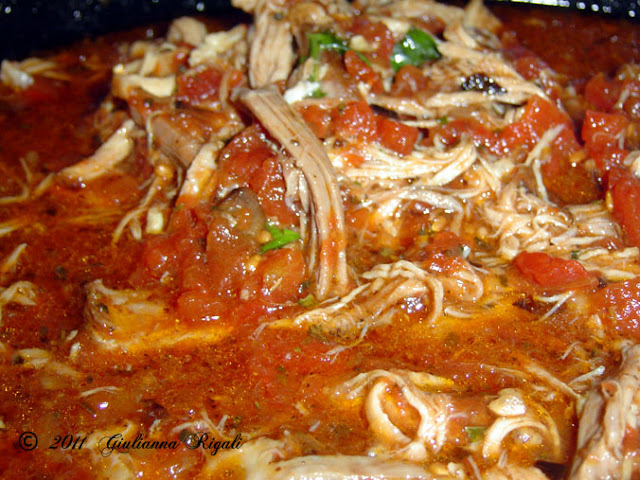 Remove the meat to a cutting board but leave the sauce in the slow cooker with the heat on. 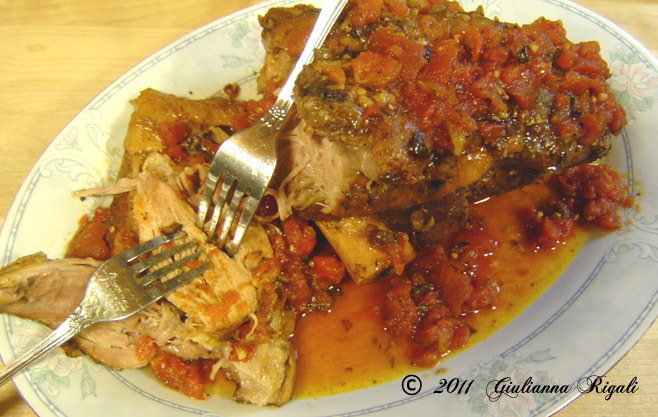 With two forks, tear the pork into bite-size pieces. 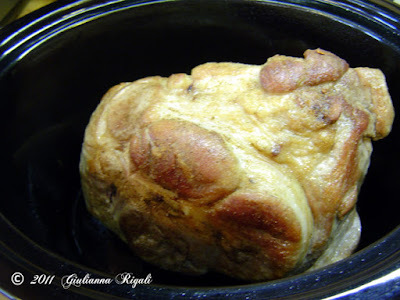 Return the pork to the cooker to reheat. Stir in the basil. * What I did differently: We are on a tight budget, so I bought the cheapest cut of pork shoulder roast I could find and it did have a small bone in it. It was about 4 lbs and I did NOT tie it before browning it and adding it to my olive-oil sprayed crock-pot. I crushed my fennel seeds in a mortar first, but you can also crush them by folding a towel over them and using your rolling pin to smash them. I did not use the puree, instead I used two cans of whole tomatoes (grown in America), but were roma/plum type. I did not cut the tomatoes first, as I like to break them apart AFTER they cook. This still came out DELICIOUS. I will definitely make this again! 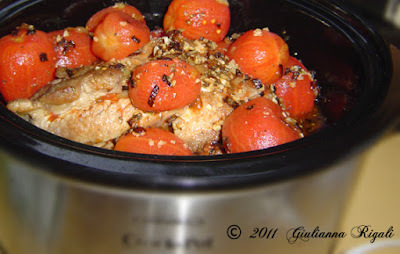 ** Recipe from THE ITALIAN SLOW COOKER by Michele Scicolone. Copyright (c) 2010 by Michele Scicolone. Reprinted by permission of Houghton Mifflin Harcourt Publishing Company. All rights reserved.